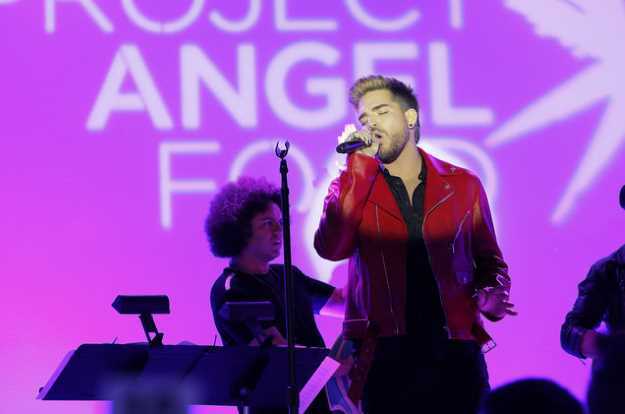 Adam Lambert performs during Project Angel Food's 2017 Angel Awards on Aug. 19, 2017 in Los Angeles. George Michael -- the Grammy-winning singer-songwriter who died last Christmas at 53 -- was honored posthumously in Los Angeles on Saturday night (Aug. 19) for his decades of humanitarian work with Project Angel Food, the L.A. non-profit that delivers meals to people who are critically ill. The occasion was Project Angel Food's 27th annual Angel Awards, during which Michael won the Elizabeth Taylor Leadership Award, named for the actress who was a longtime PAF benefactor and among the earliest activists for HIV/AIDS fundraising. Adam Lambert, who performed a three-song tribute to the former Wham! frontman, was one of several stars of music, television and Broadway who helped raise funds for the charity while remembering Michael's contributions to music and his quiet philanthropy. "George Michael was a God-gifted voice from the heavens," Lambert said. "And he raised half a million dollars for this organization." Michael was in fact Project Angel Food's single largest individual benefactor, giving $25,000 annually since 1993 -- donations that began with Michael leaving an unsolicited check at Project Angel Food's front door after learning the organization had then fallen on hard times. Michael, who ranks among the best-selling recording artists of all time with sales of more than 115 million albums, also occasionally worked in the PAF kitchen through the years -- volunteerism that was highlighted in an emotional video tribute to him during the gala. More than 470 people paid between $500 and $2,500 to attend the fundraiser, which was held in the parking lot adjoining PAF's Hollywood headquarters -- transformed for the evening into a starry outdoor party space. Among the evening's other honorees: Longtime PAF supporters Nordstrom and the news operation of KTLA Channel 5, including station vice president Jason Bell and longtime anchor Gayle Anderson. PAF executive director Richard Ayoub said he expected the evening to raise nearly $600,000. NCIS star Pauley Perrette donated $10,000 earmarked for a new van for meal delivery. Longtime PAF benefactor Eric McCormack, who is about to return to prime time in NBC's reboot of Will & Grace, arranged for four tickets to a set visit, show taping and cast meet-and-greet that raised $20,000 at auction. Designer Michael Kors, Tony-winner Christine Ebersole, the producers of Hamilton, The Pantages Theatre, and the long-running CBS soap The Young and The Restless were also among celebs and productions offering one-of-a-kind experiences for auction. Carson Kressley, Sharon Lawrence, pop singer Aaron Carter and Broadway's original Dreamgirl Sheryl Lee Ralph were among the presenters. But it was Lambert who stole the evening, with powerful renditions of Michael's 1987 hits "One More Try" and "Faith." Lambert, who is in the midst of a world tour as frontman for Queen, spoke of Michael's work on the 1991 tribute to the late Queen frontman Freddie Mercury. "Now I know my way around a Queen song," Lambert said. "So I'm gonna connect this circle and we're gonna do 'Somebody to Love'" -- watch below. The evening was also noteworthy for the announcement of a new statewide nutrition initiative. "The state of California is funding Project Angel Food for the first time ever," executive director Ayoub said from the stage. "We believe that with our medically tailored meals, we can reduce health care costs by 20 percent." Founded by author and activist Marianne Williamson and born amid the AIDS crisis of the late 1980s, Project Angel Food has delivered more than 10 million meals (free of charge) to people who are housebound due to life-threatening illnesses.